Author(s) Hass, Joel, R.; Weir, Maurice, D.; Thomas, George, B. For 3-semester or 4-quarter courses in calculus for math, science, and engineering majors. 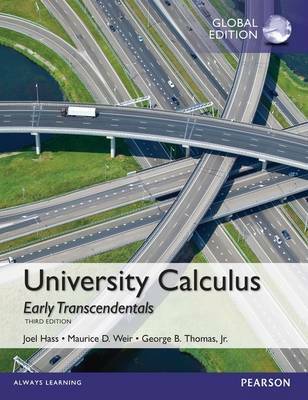 University Calculus, Early Transcendentals, Third Edition helps students generalise and apply the key ideas of calculus through clear and precise explanations, thoughtfully chosen examples, meticulously crafted figures, and superior exercise sets. This text offers the right mix of basic, conceptual, and challenging exercises, along with meaningful applications. This revision features more examples, more mid-level exercises, more figures, improved conceptual flow, and the best in technology for learning and teaching.